PRIME GOLD COAST LOCATION CORNER UNIT COMPLETELY RENOVATED 3 BDRM, 2 BATH, 1850 SQ. FT HAS ALL THE FINEST FINISHES. 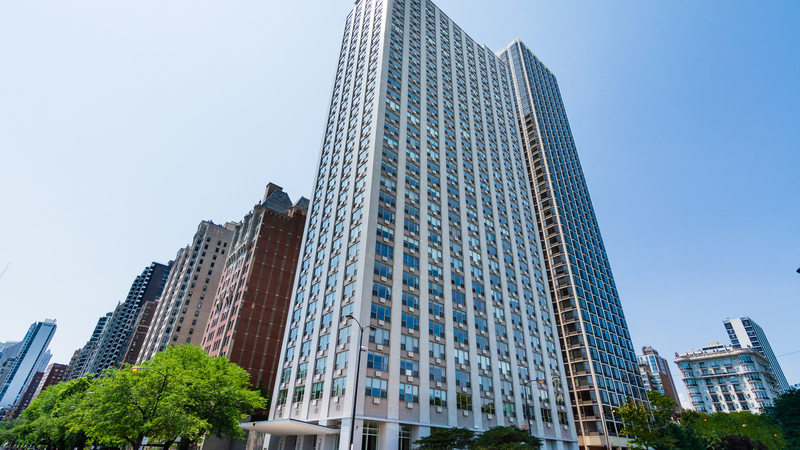 OFFERS SUNNY UNOBSTRUCTED LAKE MICHIGAN & LINCOLN PARK & CITY VIEWS. COMBO LIVING/DINING RM IS IDEALLY SIZED FOR ENTERTAINING. 3RD BEDROOM CAN EASILY BE CONVERTED TO BE USED AS 3RD BEDROOM OR DEN. KITCHEN HAS NEW CALCATTA QUARTZ COUNTERTOPS, WHITE ACRYLIC CUSTOM CABINETS, ALL NEW SS APP, WASHER/DRYER & DISHWASHER ARE BOSCH. OTHER APPLIANCES ARE HIGH-END GE. BACKSPLASH IS POLISHED GLASS TILE, RECESSED LIGHTING UNDER THE CABINETS, NICE SIZE PANTRY. ALL NEW HDWD FLOORS THROUGHOUT. NEW BATHS W/PORCELAIN TILE FLOORS. AMPLE CLOSETS, NEW DOORS, ALL FAUCETS & SHOWERS ARE GROHE. NEW BLINDS. VERY WELL MANAGED BLDG OFFERS BEAUTIFUL & IMPRESSIVE RENOVATED LOBBY. 24/7 DOOR STAFF. 2 SUNDECK, STORAGE, FITNESS RM, VALET GARAGE PARKING FOR RESIDENTS & GUESTS. BLDG LOCATED ON A CHARMING BLOCK & STEPS TO TRANSPORTATION, CITY'S BEST PARKS, SHOP & RESTAURANTS. Directions CORNER OF INNER LAKE SHORE & NORTH AVE. GO ON E NORTH AVE TO THE END & PARK IN THE BUILDING. Property information last modified by seller on Monday, March 18, 2019, 02:46 PM CDT. Information Deemed Reliable But Not Guaranteed. Unauthorized duplication, use, or linkage is prohibited. The information on this web site is for personal, non-commercial use and may not be used for any purpose other than to identify prospective properties consumers may be interested in purchasing. Monthly Payment Calculator results are for illustrative purposes only, not a financing opportunity; calculations assume a 30-year fixed-rate mortgage and do not include closing and other costs. Property Tax on NEW properties is estimated at 1.5% of Listing Price for payment calculation purposes; actual value may be higher or lower.